"Have a Safe Flight. I Love You. 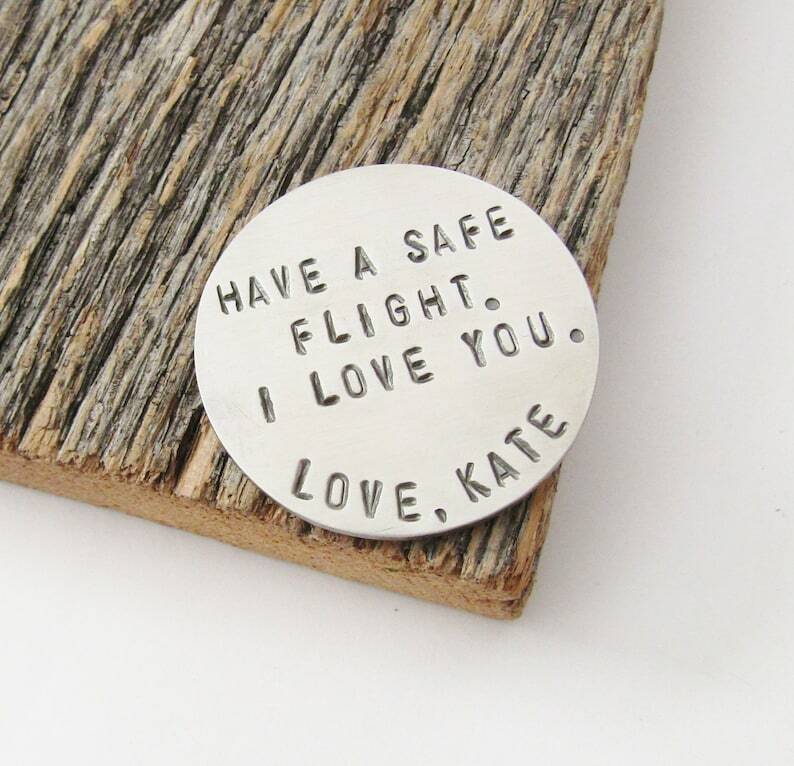 Love, _______" - good luck pocket token or wallet keepsake. Just a special gift to give to someone that's going away, a child flying alone, or someone whom you want to know you are thinking of them! Tuck it away in your wallet, purse or pocket for a special reminder that they're loved and thought of. This custom, hand stamped gift is pictured in stainless steel. It can also be created in antiqued copper, antiqued brass, or bronze. Great memento for a daddy or mommy that's away in the military. You can personalize these custom gifts with your own message (as long as it fits) - it does not have to be purchased as shown. Any customization can be added to the notes to seller section at checkout. Each circle measures approximately 1 1/2" x 1 1/2"
Any other questions - just ask! Most of our shop consists of items that can be customized to make it extra special! Personalizing is simple....Just type your message wishes in the notes box at checkout. The notes box will appear on the payment screen during the checkout process. If we have any questions, we will contact you about your message. If you don't hear from us, that means we understand your request and will complete it as instructed. We absolutely love our WHOLESALE accounts and are constantly seeking new shops to stock our items across the US and worldwide. Contact us to inquire about pricing, availability, and opportunities to collaborate. We do not offer cancellations once purchases have been made. We start work on orders immediately in most cases. The time it takes for us to organize our production, ensure materials are on hand, order materials if needed, and essentially run our shop efficiently does not allow us to make exception to this policy. WE DO NOT SHIP ON WEEKENDS OR HOLIDAYS. If your ship date lands on either of these options, it will be mailed on the next business day. Every item has a estimated completion time associated with. This can be viewed by clicking on the SHIPPING/POLICY tab within the item listing page. This is the time that it takes to complete/produce the order (not the time frame that you will receive it by). A majority of our items are customized or made to order - so those purchases will be sent no later than the time indicated on the shipping tab on the listing. Many times it is quicker than this posted time, but we feel better indicating a longer time so there is no discrepancy when it comes to deadlines. We work tirelessly to get orders out quickly! Any item marked as delivered on the USPS tracking will be considered as such. We do not replace or refund for items if tracking shows that it has been delivered. If this is the case, please check with neighbors, the front door, and follow-up with your local post office to determine what can be done. If an item is lost in the mail, please contact us and we will do what we can to help, however the first step would be for the customer to contact the USPS using the tracking # to inquire. No package will be determine lost until 4 weeks past it's expected delivery time (US) or 8 weeks (INTERNATIONAL). No exceptions - even if it is a gift for someone due to a holiday. We simply can not be responsible for these unexpected situations. We will ship all orders via USPS to keep shipping costs low to our customers. All shipments of lures are wrapped first in tissue paper, to protect from scratching. Then wrapped in bubble wrap, to protect while shipping. In almost all cases we will ship in a small envelope using USPS First Class mail, which indicates a 2-5 BUSINESS day shipping time frame. We do not promise this delivery time, but simply re-state what is posted as the USPS standard guidelines. The address given is where we will ship to. Buyer is responsible for re-shipping fees and purchases will not be refunded because of a wrong address or missing information. You can choose a shipping upgrade at checkout for faster delivery. We ship via USPS First Class International mail, which can take anywhere from 1-4 weeks depending on your location. We have sometimes experienced delays up to 6-8 weeks on rare occasions. Please understand that the delivery time of international shipping is completely out of the control of a shop owner due to customs processes and varying countries policies. Please allow the full 8 weeks to expire before claiming a package is missing, especially during holidays. If we mail a package and it is held for VAT fees, and a customer does not pick it up resulting in it being shipped back to us, we DO NOT resend to replace a missing item until it is received back to us in original condition and re-shipping costs are paid. Returns are accepted ONLY if we have made a clear mistake in customizing. Because our job involves custom painting and handmade items, no two lures will be alike. You will need to be aware of inconsistencies and one of a kind uniqueness to each order due to the use of varying metals and/or paint applications. We do not re-make items for inconsistencies in the hand stamping method or because of variances in the antiquing process of the metal. If you have custom specifications, these must be stated in the original purchase. We do not issue refunds when a purchase is made and it does not arrive by a certain date/holiday. Indicating you want an item by a certain date in the notes does not ensure this will happen.